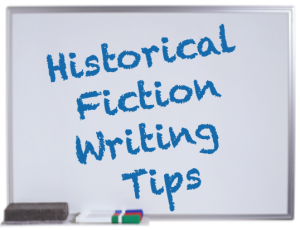 Today I’ve selected authors’ tips on writing historical fiction from around the web. Because languages are always important for a writer! Armed warriors as her guard. The castle on Clare Island had a perfect view. When she stood on its ramparts and looked eastwards, she could see the mainland ahead of her, Achill Island to her left, the holy island of Caher to her right, and the restless seas running between them. Her clan, the O’Malleys, controlled these waters; their motto was “powerful by land and sea”. Eithne wandered to her bedroom window, rubbing her eyes and trying to make sense of the strange dream she’d just had. From this height, she could see the rocky cliffs and, if she listened carefully, could hear the crashing of waves far below. One of her maids had already started to air out her sheets, while another placed her breakfast porridge on the table. This tower, all of its storeys apart from the ground, was the only space she had ever known. Her maids — twelve of them in all — were the only people she had ever known. She didn’t even remember her father, who had placed her here when she was a small child. Last year, I posted an article about making little mini books out of a single sheet of paper. Since then, I’ve figured out how to make them digitally! Below you will find a simple version of Sigrdrifa’s prayer, the only direct invocation of the Norse gods preserved from ancient times. It is a classic and beautiful prayer that can be said anytime, but is especially appropriate at the start of one’s day, observing the sun rise, and at the Solstices. Copy and paste image into a word processing program (set up with narrow margins) to make sure the image takes up most of a full sheet of paper, expanding as necessary. After printing, trim away the margins on the outside of the thick black lines. Let your child color the pictures, then follow directions given in my article magic one-sheet-of-paper mini book to complete the book. Special Note: During the Month of March, Women’s History Month, we will be highlighting women in pharmacy (past and present) who have contributed significantly to the profession. One of the first female pharmacists in the United States, Elizabeth Marshall, was born in Philadelphia, Pennsylvania in 1768. Many people credit her with being the very first female pharmacist in the United States. In reality, that title actually belongs to Elizabeth Gooking Greenleaf. 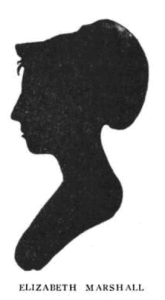 However, while she may not have been the first American female pharmacist, Elizabeth Marshall was most certainly the second and was no doubt a hugely important figure for both women in the Pharmacy profession and for Pharmacy history in general.